The Bozeman Film Society (BFS), originally known as the Bozeman Film Festival (BFF), celebrates its 40th anniversary this fall, and launches the landmark season with their annual Story Under the Stars event followed by a full line-up of independent film screenings at the historic Ellen Theatre in downtown Bozeman. Founded in 1978 by local film lovers and Montana State University (MSU) English and Film Professors, the organization originally screened classic, foreign and arthouse films in various venues around town beginning with the Ellen Theatre and MSU’s Linfield Hall, expanding to a 26-year run at the Rialto Theater and a 10-year run at the Emerson Art Center’s Crawford Theater from 2006-2015. Returning to their roots at the Ellen Theatre in 2016 with a new digital projection system, the organization now screens up to 35 first-run films in downtown Bozeman each season, focusing on those that are highly acclaimed, but not typically screened at the large multiplex in Bozeman. One of the Gallatin Valley’s longest running art non-profits, the mission of the BFS has always been to open a window from small-town Bozeman into the worldwide culture of ideas, conversations, art, and perspective through the transportive power of independent film. They also consistently present innovative collaborations and invite industry insiders connected to the films, enhancing many of the screenings by offering insight into filmmaking, connecting audience to other area non-profits and causes, and spurring a thought exchange within the community. Past guests include actors Bill Pullman, Michael Keaton, and Lily Gladstone; Directors Marni Zelnic (Druid Peak), Jacob Young (The Dancing Outlaw) and Jared Moshe (The Ballad of Lefty Brown); celebrity chef Tom Collichio (A Place at the Table); Paleontologist Jack Horner (the Jurassic Park series) science writer David Quammen (Walking Out); Executive Producer Patrick Markey (A River Runs Through It, The Horse Whisperer); The Bozeman Jazz Collective (Miles Ahead, The Cabinet of Dr. Caligari); plus many more. Most Bozeman Film Society screenings take place at the historic Ellen Theatre in downtown Bozeman, with some films also shown at the re-invented Rialto in a cabaret setting, and, on occasion, at the Emerson’s Crawford Theatre. To kick off its 40th season, the BFS is hosting the 9th annual Story Under the Stars on Friday, August 24, 2018, featuring the 1978 Oscar-winning mega-hit, Superman: The Movie, starring Christopher Reeve and Margot Kidder. This popular family-friendly event takes place on the lush lawn of Story Mansion Park, and includes a Kryptonite scavenger hunt, an all ages Superhero parade for people and pets in costume, Fire truck and Police car demos, kids crafts, popcorn, ice cream and food trucks. Super hero costumes are encouraged, with activities and food beginning at 7:00 PM and the film beginning at dusk. Special 40th anniversary events will take place throughout the year at movie screenings and will include ticket giveaways, BFS Sponsor promotions, and fun pre-film events. 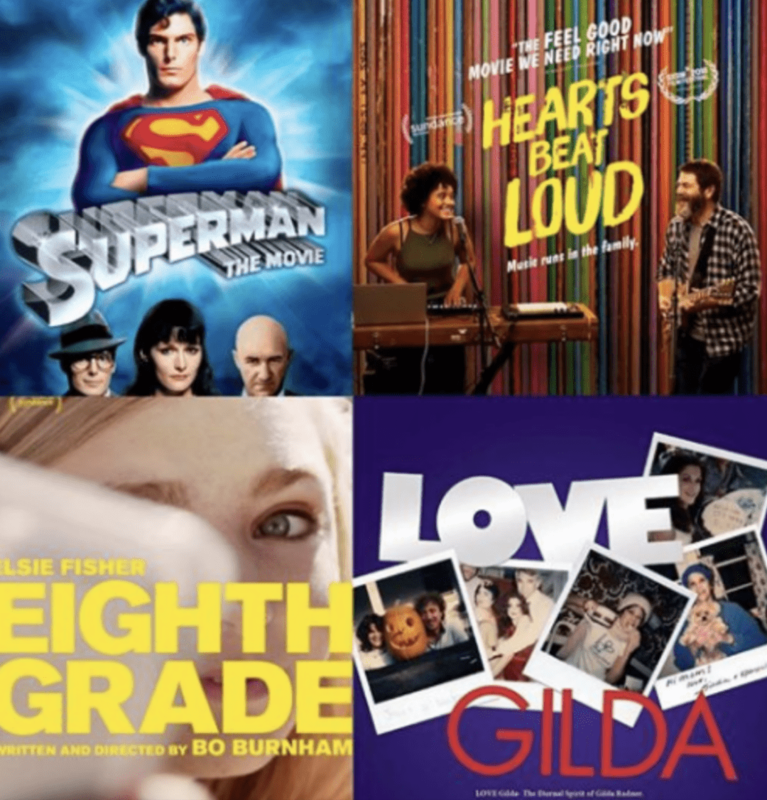 The new season officially kicks off at the Ellen Theatre with Love, Gilda on Wednesday, September 19th and will feature special giveaways, including gift certificates and items form BFS sponsors. Local business sponsors make up a large portion of the funds needed to operate the Bozeman Film Society each season, and those who support BFS are recognized before the start of each film with the wildly popular animated sponsor reel. Sponsorship spots are still available, with information available on the organization’s website. For more information about the 40th year of the Bozeman Film Society, along with a schedule of upcoming films and sponsor information, check out www.bozemanfilmsociety.org.